The vowels are interesting – the ‘i’ is a single circle, then the other vowels have lines off in different directions, left, up, down and right. The whole work can be found on the website of the Munich library – see the first page here. In fact an early page of the manuscript here offers the alphabet sequence. I mention it again now only to bring it to wider attention, for people who do not know it, but it is nonetheless interesting in the context of my own work on the manuscript. One curiosity is that although the text uses the cipher, it also uses Latin alongside, which would rather seem to destroy any attempt at secrecy! Also, another point worth noting is that the cipher is extremely regular in its design, as we can see from the patterning of the vowels mentioned above. 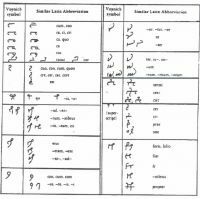 This regularity is not the case with the Voynich script. 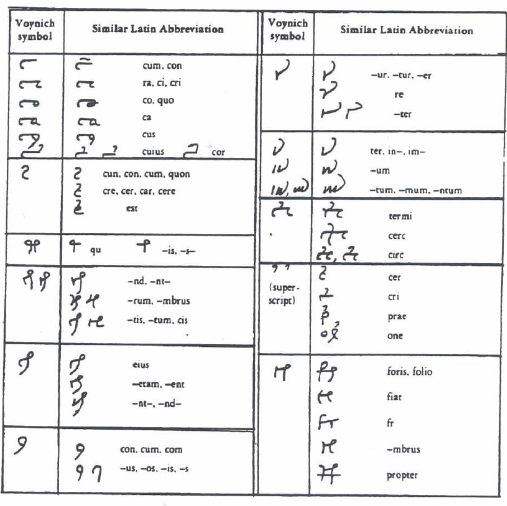 This might then suggest that the Voynich script is not likely to be a cipher developed by a single person (in which case it would probably have regularities like Fontana’s), but a script developed rather as the Glagolithic script was, perhaps by a number of people, perhaps derived from other scripts and intended for communication instead of obscurity. Thanks for mentioning my views on the manuscript, but if I might clarify – I didn’t suggest it was only a merchant’s handbook, but particularly pointed out that in my opinion and after analysing them, that certain folios had specific application to navigation. In the medieval period, ‘merchants’ weren’t just people who bought and sold things – as you may know, but others won’t. Some owned their own ships, just as navigators and pilots also bought and sold items of value. In addition, many of the botanical folios – as I found to my surprise – were ones chiefly used in provisioning and maintaining caravans and/or ships. Some plants are valued chiefly as food, others for fibre and so forth. So it’s a compendium of matter useful to the sort of people (often families) who managed the east-west trade. IMO. I should add that I’ve seen nothing in it requiring us to look further east than south-east Asia, but that’s not to say the handbook mightn’t have reached Guangzhou. It is very pleasing to see so many following this lead – but I would occasionally like to see my name mentioned when the results of my research are. I have now read many many postings from you recently and you work very hard. One posting is more interesting than another because you go directions that we all went already before. But that’s ok. I was trying to find your blog but it seems gone. If there is anyone who wants to sell me the book of Batista at a reasonable price, let me know. Also, if you have a link or a book with pages from one of the other books, please let me know ! Secondly, I also followed the Mandaic people and analysed a big piece of text and compared it with the Voynich manuscript (VMS) text. Mainly because the Mandaean people have an extra 5 days in the 8th month i was interested. That because we see the extra 5 days in the zodiac of gemini of the VMS. But anyway the languages have NO intrinsic overlap and so they do not have resemblance. But that does not mean everything of course, because perhaps the VMS is a mix of languages. I am also looking into that. >> alcune pagine la scrittura cambia forse cambia in base all’umore del compilatore. Loose translation: Depending on the mood of the writer, text may change ! How true in the case of Fontana! if I understand correctly, the manuscript of De Omnibus Rebus Naturalibus is lost. The work survived through this 1554 printed edition. 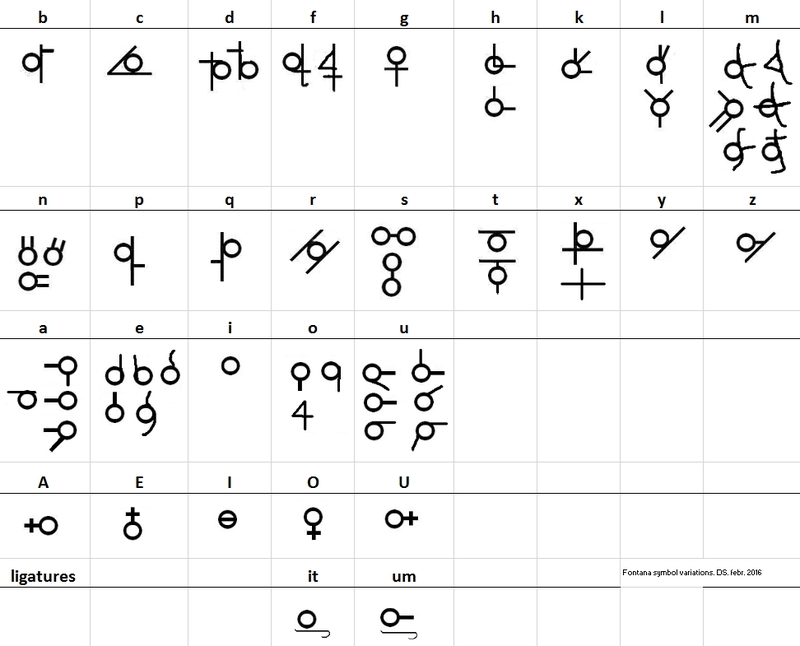 I attach an image of the alphabet tables from Battisti’s book. I am sorry for the poor quality. I would like to share a few ideas about the marginalia of BNF Cod. Fonds Latin 7272, that Nick Pelling recently posted on his blog. Nick noted that the encrypted marginalia were apparently written right to left and that there are repeating words. Actually, each one of the 28 Mansions has a marginal annotation. Each annotation includes a single word and, a few centimeters below, a longer comment. I transcribed the 28 encrypted title words (actually 26 of them, because a couple were missing or unreadable). I noticed that the labels seemed to repeat four times: a repeating set of seven unique labels. Being fond of obvious ideas, I though they might be the Latin names of the planets. I attach the labels of Mansions 12-19, starting at f162r. They read right to left and are all in the genitive case: mansions of Saturn, of Jupiter, of Mars etc. Having identified most of the characters thanks to the planet labels, I also managed to read some of the longer inscriptions. They basically elaborate on the content of the main text, providing more detail about the properties of each Mansion. Here is a table with the symbols I have more or less identified. There are a few more of whose function I am not sure. It seems that two very similar characters correspond to “C” and “T”, both look like a mirrored “C”. I think that “T” is represented by a smaller version of this character (so the shape is basically the same, but the character for “C” is larger). The same mirrored “C” is used to represent “M”, placing above it the standard horizontal line which usually denotes Latin abbreviations. In the marginalia, that same line is often used with its normal meaning of “missing n/m”. “N” is also similar to a mirrored “C”, with a short dash at the bottom right. The character that looks like a “p” or “y” seems to be used for “u”, “v” and “f”. I guess it could also be used for “p” and “b”. Thank you, Darren! I was lucky to have a sufficient knowledge of both the language (Latin) and the subject (astrology). With a German or Russian manuscript about medicine or botany I would not have had a chance! I attach the two images I had uploaded to pinterest: tenative list of decoded characters and transcription of the 19th Mansion marginalia. The Cipher Alphabet of John de Foxton’s Liber Cosmographiæ by John Block Friedman describes another early XV Century cipher (Trinity College ms R.15.21, Liber Cosmographiae 1408). This paper was mentioned by Nick Pelling in 2002. 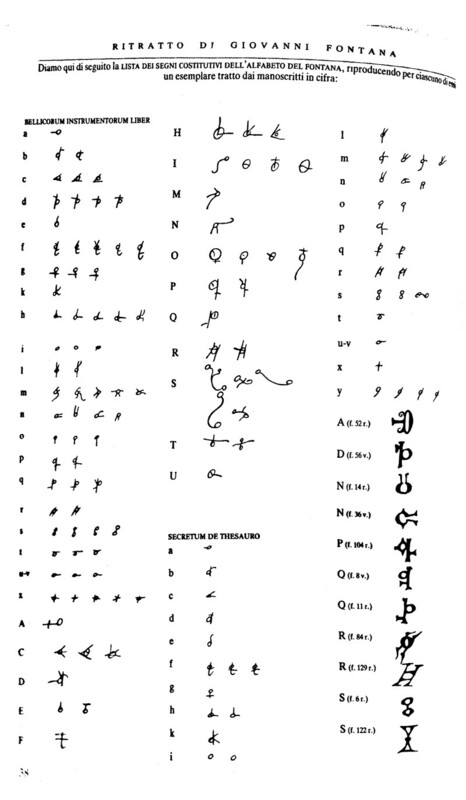 Foxton only encrypted the most sensitive words of his manuscript, using an invented alphabet (attached). I understood from Friedman’s paper that Fontana’s work does not present the same text in plain Latin and in his encrypted alphabet: he provides a title or summary in Latin, but the most relevant content is encrypted. For instance f51r describes a machine for “the artificial resurrection of the dead” (“de resurrectione mortuorum artifitiosa”), but the whole description is encrypted. I must say that I find Fontana’s text extremely hard to read, even with the key of the cipher: my knowledge of Latin is far from perfect, the encrypted text seems to be abbreviated, with lines below and above single letters, and it seems to have been written very quickly. Finally, Emma May Smith and Derek Vogt both think that the Voynich alphabet presents regular features (with particular reference to the so-called gallows). Stephen observed in this page that Fontana’s alphabet displays a similar regularity, clearly artificial, in this case: ”The vowels are interesting – the ‘i’ is a single circle, then the other vowels have lines off in different directions, left, up, down and right”. 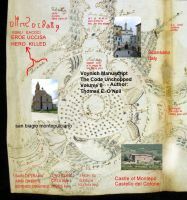 I designed several websites in the pursuit to cipher the voynich manuscript other than the way that I did in my book, Voynich Manuscript The Code Unchopped Volume II. Please have a look. Since no-one seems to be commenting on Fontana’s cipher, may I quote an interesting paragraph about it? That comes from one of the posts at ciphermysteries.com (December 6th., 2008). Others mentioning Fontana can be found using the site’s search function. It’s a good point that Prof.Bax has raised about the use of ciphers but the more interesting aspect is why they might be used, and by whom. I’ve tried to outline some of my thoughts on this topic. I don’t believe that the VM is written in code; however, there are good reasons why it might be obfuscated, or written in a script that is not widely understood. Could the VM be an example of a mercantile script? Personally, I doubt it. There are many examples of mercantile (merchants) scripts being used in Northern India and there’s no reason to assume this practice wasn’t adopted elsewhere. For example, a group of merchants from a particular clan, guild or trade might adopt a novel script for commercial advantage. Looking through the VM, I can appreciate the commercial gain that might be achieved by having a good knowledge of herbal plants and remedies, and knowledge of stars would be advantageous for merchant travellers. However, the astronomical sections of the VM appears to contain much more than navigational charts and its difficult to see how mercantile benefit could be gained from the more scientific/cosmological diagrams and star lists. I could understand this information being copied for a merchants’ personal interest, but the physical material that the VM is written on (vellum) suggests that it was created for a high-status individual or group. I think it less likely that the VM was created for, or by, a merchant. One point of note, is that there is often a European bias when considering medieval trade on the “Silk Route” – there were many other trade routes going overland North-to-South (and back) and India-to-China (and back) as well as maritime routes. This trade wasn’t focused on trade from Europe to India and China. The VM could represent the work of merchants travelling between the Caucasus and Northern India, for example, but I doubt this to be the case, for the reasons described. I think it’s much more likely that there is a religious or spiritual aspect to the VM. The question becomes therefore, why would a religious community create obfuscated or secret writings? The priesthood in ancient times obtained much of their authority from their role in defining calendars and the setting the dates of religious festivals, fasting periods, planting and harvesting times etc., which was achieved from a deep astronomical knowledge of the phases of the moon and planets, planetary motions across the night-sky and eclipses. In this respect, the priesthood really could predict the future! It would therefore be pertinent for the religious elite to encipher important religious and astronomical writings to retain their knowledge, in order to retain their authority. The priesthood could also gain authority and commercial gain from skills and knowledge of herbs, medicines and divination. This could take the form of dispensing healing scrolls and phylacteries. Drower reports in her book “Mandaean Book of Black Magic” (p4) just such activities being performed by a Mandaean priest in Baghdad – for a fee! It should also be noted that early Christians were characterised by their healing of the sick, so the association between priests and herbs/medicines is well established. On this basis, I feel the purpose and contents of the VM better aligns with it having been created for a religious purpose rather than for any other reason. I have quite often repeated my belief that there is a Judaeo-Christian/Mandaean influence in the VM. The pertinent question becomes: are there any historical examples of enciphered or secret religious writings by followers of these faiths, and if so why were they created? Surprisingly, the answer is yes. I’ve found 4 examples, and I’m sure there must be others, but the interesting aspect is what links these groups. One group known to have created enciphered writing is the Jewish sect known as the Essenes who lived in Palestine and Egypt, and were active through to the 1st-Century before being scattered as a result of Roman-Jewish War (66–73 CE). Many scholars have since pointed out the similarity between Essene and Mandaean customs. This is probably an indication of their shared Egyptian-Jewish origins. There has also been noted many similarities between the Essenes and the Karaites, another non-mainstream Jewish sect who remain in small numbers to the present time. The Essenes are probably the better understood of the early Jewish sects, by virtue of the fact that their writings, the Dead Sea Scrolls, were rediscovered in 1947 in Khirbet Qumran. The documents discovered in the caves around the Dead Sea, date from approximately 300 BCE and 60 CE and were written in Hebrew, Aramaic, Greek and Nabataean. The origin of the term “Essene” is not fully agreed, but some scholars have suggested that its derived from the Aramaic ‘assayya’, meaning physicians or healers, and they were skilled in the use of herbs in the production of medicines and the removal of demons, which were thought to be the cause of illness at this time. It’s probably not widely known that the Dead Sea Scrolls also contained a number of enciphered writings. What is particularly interesting is the kinds of scripts there were enciphered: zodiacal, horoscopes and calendrical texts. This appears to be just kind of writings found in the VM! I had previously thought that the zodiacal and astronomical pages, were likely of an Arab origin, however, all these elements (horoscopes, divination, zodiacs) were present in Jewish culture – albeit by a non-mainstream sect at a very early period (around the first century CE). The Dead Sea Scrolls also contain a “Brontologion” – a method of divination by thunder, something I wasn’t aware of before, and might explain the purpose of other mysterious pages in the VM. I’m not suggesting that the VM is the work of the Essenes, but it is evident that the tradition of secret or enciphered religious writings did exist within the “elite priesthood” of (non-mainstream) Jewish sects. The way these Essene texts were enciphered is also interesting – the original text, which is in Hebrew, is normally written from right-to-left. The encoded version text is written in reverse direction (from left-to-right) and the Hebrew characters are replaced with characters from the Greek, Phoenician and Paleo-Hebrew alphabets. The Therapeutae are another Jewish sect, similar to the Essenes, but living in Alexandria in the period up to the Roman-Jewish Wars in the first century. They are only known from a single source – Philo of Alexandria. They were also recognised for their skills in healing and “possessed arcane writings of their own tradition, including formulae for numerological and allegorical interpretations.” [ref: Wikipedia]. Some scholars have suggested that the Theraputea and the Essenes were closely related. I am intrigued by the similarity of facial features depicted in this Hellenistic Jewish fresco and the facial images depicted in the astronomical section of the VM. In some early Jewish sects (e.g. the Essenes) and presently within the Mandaean faith, there are different levels of initiates, who are exposed to secret, restricted writings and knowledge as they rise through the ranks of priesthood. For example, the Mandaean religious book the “The Thousand and Twelve Questions” is intended only for the priesthood. The Mandaean priesthood are known as the Nasurai, have access to “secret” sacred knowledge (they are skilled in religious matters and white magic), and the laity known as the Mandai who can access the general texts (assuming they were able to read, typically only the priesthood could). The writings in the Dead Sea Scrolls suggest seem that the Jewish Essene priesthood were also hierarchically structured in a similar way. The Bogomils are a European Christian Gnostic sect from the 10th-15th century originating in the Balkan region. 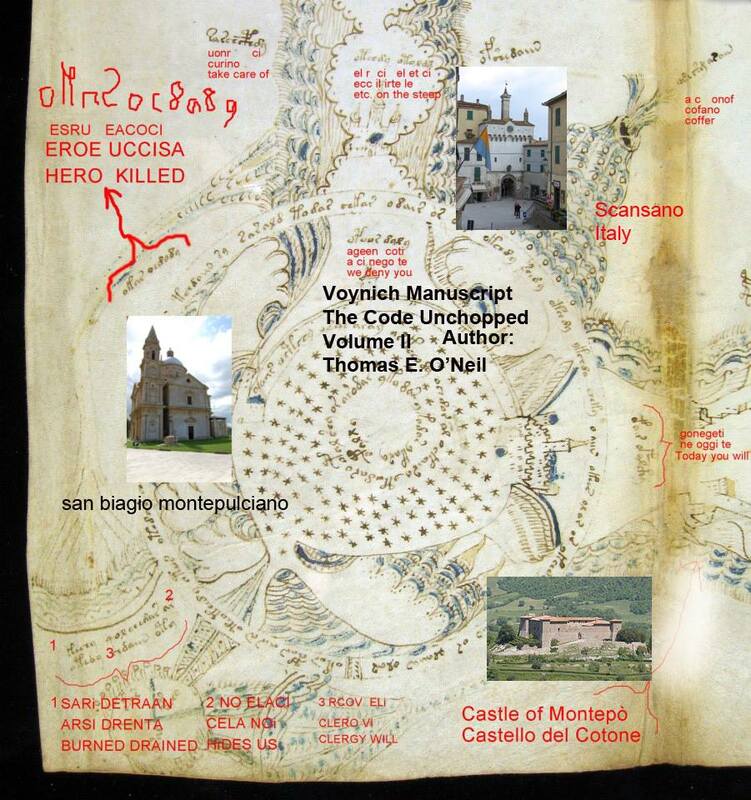 The only known Bogomil text is the lost “Secret Book (Liber Sancti Johannis). Again this is another example of “secret” writings. What links these 4 sects: the Essene, The Theraputae, The Mandaeans and the Bogomil are that they all are Gnostic sects. I’m not implying that there is a direct link between all these faiths (they may be related), but they do seem to represent a continuum of Gnostic faith over a long period of time. Again, I’m not suggesting the VM is an Essene text, or that the VM is a code, only that whatever community created the VM probably had a similar hierarchical structure so that the VM may serve a similar purpose in making sure that the information contained within was for the exclusive use by their priesthood. I believe the VM was probably written for priestly elite, in a script not generally used by the rest of their community (assuming the laity could even read). The underlying script of the VM could well be Mandaic or Arabic, or another language, but written in a novel script to obfuscate, just as the Essene did with Hebrew. There is no firm evidence to suggest the VM is written in code, however it seems possible that the VM represents a “legitimate” obscure script used by the priesthood of a Judeo-Christian sect. I believe that a non-mainstream Judeo-Christian sect probably created the VM and that the Mandaeans, an early example, or later offshoot, best fits the evidence so far. The role of priesthood was often exclusively held within a few families, or a tribal group. There might plausibly be only a dozen or so priests, at any one time, and it seems possible that isolated from external influences over many tens of generations a unique priestly script could evolve. It seems a long stretch to imagine that writings and scribal traditions from the 1st-3rd century could continue right through the 15th century, but the fact that Jewish, Christian and Mandaean writings dating from this time have survived, suggest to me that its plausible. One final point, which I include just for speculative interest. The discovery of ancient texts at Qumran in 1947 was not a unique event. Medieval accounts report the discovery of other ancient texts in the nearby vicinity (Jericho) in the Middle Ages. These were copied and generated considerable interest at the time. It thought that these rediscovered texts may have influenced Jewish Karaite beliefs. 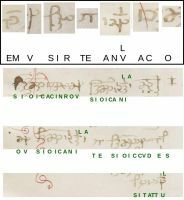 I wanted to highlight some further examples of the use of ciphers amongst early Judeo-Christian and Gnostic groups, in addition to the Essene described above. This illustrates that this practice seems to have been fairly widespread. As mentioned in an earlier post, some Essene texts enciphered Hebrew which is normally written from right-to-left. The encoded version was reversed in direction (left-to-right) and the Hebrew characters were replaced with characters from the Greek, Phoenician and Paleo-Hebrew alphabets. Another example of enciphered text is found in the Gnostic “Book of Zostrianos”. The Book of Zostrianos (Oracles of Truth of Zostrianos – God of Truth – Oracles of Zoroaster) was written c250 CE and the surviving copy is a Coptic translation from Greek dating from c350 CE. This work was discovered amongst the Nag Hammadi texts and is regarded as a non-Christian Gnostic text. It describes the mystical ascent of the soul towards gnosis. This theory of the souls progress towards a mystical leap to gnosis was described by Plato in the Symposium, which formed part of the teaching of Platonism in the 2nd century. In the manuscript the title after the text, the words “Oracles of Truth .. Zoroaster” are written in a Coptic alphabetic cipher and would not have been intelligible to the unprepared Coptic reader. 1) Mani was raised as a member of the Jewish-Christian sect of the Elcesaites (a subgroup of the Gnostic Ebionites). 2) In 240–41, Mani travelled to “India” (i.e. to the Sakhas in modern-day Afghanistan), where he studied Hinduism and was probably influenced by Greco-Buddhism. 3) Returning in 242, he joined the court of Shapur I, a Zoroastrian. 4) The canon of Mani included six works originally written in Syriac, and one in Persian, the Shapuragan. 6) Mani wrote the book Arzhang, a holy book of Manichaeism unique in that it contained many drawings and paintings to express and explain the Manichaeist creation and history of the world. I think that many of these influences can be detected in the VM. Manichaeism was a world religion founded by the prophet Mani 216–274 CE. It was a gnostic religion of Late Antiquity, of Iranian origin, which was once widespread but is now extinct. Mani was born in or near Seleucia-Ctesiphon in Parthian Babylonia (Iraq), at the time still part of the Parthian Empire. Six of his major works were written in Syriac Aramaic, and the seventh, dedicated to the Sassanid shahanshah, Shapur I, was written in Middle Persian, his native language. He died in Gundeshapur, under the Sassanid Empire. [ref : wikipedia]. Manichaeaist ideas were later to be expressed by European sects such as the the Bogomils</a> and Paulicians; and the Cathars. And, of course, Manichaean philosophy placed great emphasis on the number ‘5’. 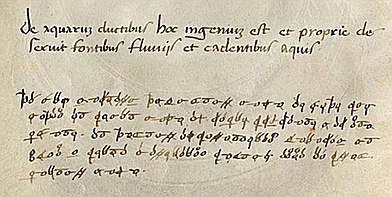 de acquarius ductibus och ingenius est et proprie de pecsuit fontibis fluuis et cadentibus acquis.sritta in latino, la scrittura cifrario non ha nessun nesso con la scrittura vm. non si puo abbinare per decodificare lo scritto del vm,la scrittura vm è stata da me decifrata, l’alfabeto da voi menzionato non ha nessun riscontro.cordiali saluti giorgetto.lo scritto del vm è stato scritto da un solo individuo, alcune pagine la scrittura cambia forse cambia in base all’umore del compilatore. Thank you giorgetto, but do you mind helping us to translate this? My Italian is weak! Apologies.